So this year I finally made my way to Bellevue to visit my sister, niece, nephew, and play a bunch of games with some of my Seattle friends, including my brother-in-law. Sasquatch was excellent, and I had an absolute blast all week! Here's a rundown of the games I played and what I thought of them. 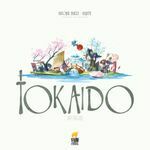 Tokaido with Jeremy Brower, Matthew Titelbaum, Todd Gardiner, and April Daniel+Diane Scirica (Diane won, 69-68-67-66-59. Close game!) I like this game, but maybe better with fewer players. I think 2p might be best, with the neutral guy. We played the base game, but I read about the expansion bits - some sounded good, some sounded just more random. Game 1 with David Chott, Matt Anderson, and Joel Eddy. I liked it, though a couple things felt a little odd... turn order felt like it needed compensation (said the guy going last - David), and some complained about the random order things came out. I don't think it's so bad, but if the order of 2 tiles is reversed sometimes it makes a big difference in the outcome. Game 2 with Matt Anderson, Jeremy Brower, and Matthew Titelbaum. This time I went with an entirely opposite strategy - first game I got pollution then reduced it... this game I started with clearing my board of pollution, even got some good income from that. I won by 16 points, which is a TON in this game. 2 disparate strategies both won, but frankly they felt VERY similar. I feel like the buildings are too samey perhaps. One last thing - maybe it's my play style, but I can't imagine ever buying anything other than the big Energy building turn 1 (unless maybe the Energy symbol came up that turn). It seems way too awesome. Games 1 & 2 with Jeremy Brower + Matthew Titelbaum, David Chott + Matt Anderson, Myself + Joel Eddy. I didn't care for this. It's like a team game where you don't really interact with your team at all. Gentlemen play a sort of Galaxy trucker efficiency resource management game, while Ladies play a sort of card drafting double-bluff set collection game. And they're related because the Gentlemen's moneymaking supports the set collection, but it just seemed fiddly and didn't seem that fun to me. Game 3 with myself + Jeremy Brower, Nyomi Lei + Sean Flinn, Andrea Chin + Ben Hemry. Ben's arms were totally in the way of my drafting tiles - I feel like the game is not good to play while sitting in a line on one side of a table. I really don't care for this game at all. Lords of Waterdeep (and both expansions) with Jeremy Brower, Matthew Titelbaum, and David Chott. We played with Mandatory Quests - I usually leave those out. Matt got screwed by them, Jeremy got really screwed by them. I had a card that made me immune... which people thought was too strong. I had like 9 corruption at -8vp each near the end, but by the time the game was over I got down to 3 at -4vp. Matt now agrees with me about not wanting to play with mandatory quests. I maintain that Lords of Waterdeep is one of the best games of last year, and the expansions did a good job of revitalizing the game for my friends and I.
Rockwell with Matthew Titelbaum and Jeremy Brower. This was a pretty good game with some worker placement, upgrading of abilities, and resource management. There are races for all of the point-scoring things, so it's best to do them first, but of course you can't do everything! Jeremy kept beating me to everything I was trying to do, and it looked like he was way ahead at the end, but at the last minute we remembered that there is a bonus for having the most of each resource leftover. That helped me close the gap, and Jeremy only won by 4vp. I would play this again, it was pretty good. Lagoon, by David Chott, with Jeremy Brower, Joel Eddy, and Sean McCarthy. This was David Chott's prototype which he intends to put on Kickstarter soon. It had some interesting mechanisms where you get potential points for supporting a color (putting a tile of that color into play gets you a token of that color, which is worth 1 point IF that color dominates at the end, and removing a tile of that color is worth 2 points IF that color does NOT dominate at the end). The three colors have a sort of Rock Paper Scissors relationship. It's kind of an abstract game, which isn't my favorite type of game. Each tile on the board had a unique effect, but all the effects of a color were similar, but different in the details. This made it feel like a lot of work to track what each player was capable of doing, since every turn there are from 3 to 25 tiles a player could choose to activate (likely on the order of 10-12 though). 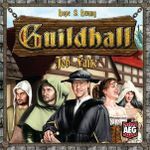 Guildhall: Job Faire with Jeremy. We played with all the new professions from the expansion. It was wacky. I continue to agree with Russell and Mandy that there should be some kind of turn order compensation - just finish out the round, or give later turn players more options or more cards in their starting Guildhall (like "4 cards, no more than 3 in any chapter" perhaps). Or possibly play to 24 (instead of 20), and start with 0/1/2/3vp based on turn order. Tash-Kalar: Arena of Legends with Jeremy. I like the Flares - I don't remember seeing them last Feb when I saw this game at Strategicon, but maybe they were there. I don't really play abstract games much, but I liked the card play and goals in this one. 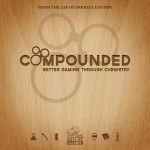 Compounded with Matthew, Jeremy, and Chase. I didn't care for the negotiation part of the game - most of the time it seemed we weren't trading 2-1 because nobody has space for that, and 1-1 trades seem lopsided or are only occasionally available such that they're mutually beneficial... I don't generally like games with negotiation like that. There were rules about lab fires that just seemed weird. Without those 2 things, the game was kinda cool. I wish I'd upgraded my ability to play more pieces first rather than my ability to draw more, I didn't realize off the bat that that would be key, and when I did I just couldn't draw the cubes to get them / people had claimed them. Going, Going, GONE! with Jeremy and Natalie. Cute auction game - more fun than I expected. I didn't do too well though. Game 1 with Matt, Joel Eddy, and Jenny somebody. I liked this much better than I expected. Took a while for me to figure out where I wanted to put routes, and I kept realizing after my turn what I thought I should have done. I managed to get 4 relics (3 different types), one for 14vp, another for maybe 12? Trains and Stations with Matt and Sean McCarthy. I liked this worse than I expected (and I didn't expect much). Seemed like it ended way too early. There are rules for upgrading goods types and for building additional buildings, but we ended the game before that came into play. We were unclear on some of the rules, and it's possible we played wrong. 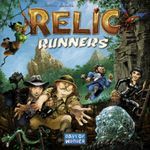 Rules threads on BGG not terribly helpful (the game is still brand new, not much info out there yet). We were all pretty disappointed. Nauticus with Jeremy, Joel, and Ken Rice. A role selection game like Puerto Rico, where the actions you can take get paired randomly with Bonuses (PR's Privilege) and a number of free virtual workers to use. Each action costs workers to use, and you can accumulate workers. Stuff costs money, and that is a tight resource as well. Through the actions you build ships out of ship parts, and load them with goods to deliver. There are points and bonuses for completing boats (the bigger the boat, the more work it is to complete, and the more points and bonuses you score when you complete it). You also get points for delivering more and more of like goods, and there's an action that gets you some points as well, based on how many crowns you have (something you get from those bonuses). 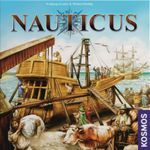 I liked Nauticus, and would definitely play it again. That said, the final round was a little wonky, but I think that's mostly due to our inexperience. There's a special 'extra action' tile you're allowed to use once per game. The rules suggest waiting until the final round to use it, and if you do, I can see how that would dodge some of the wonkyness of that last round. It makes me wonder if the option to use the extra action ahead of that time is something of a trap - perhaps players could play it safe by assuming the rule were that the extra action tile must be used in the last round. 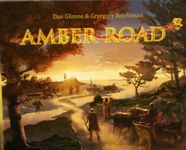 Amber Road with Jeremy and Bill Mattson. This was a simple race game which I honestly did not care for. You move forward 1 space, or pay some stuff to move X spaces (where X is the number of Bison you have). If you land on certain spots, then you can fill up your water, or hunt for food (with a cute minigame that involves shooting a disc with a rubber band to hit a target on a board), or get 1 Bison back. So it's about managing your 'speed' and stopping where you want in order to get resources back or block opponents from doing that. That description makes the game sound better than it is, if you ask me. I thought for sure Jeremy had this one, but it turns out he ran out of juice at the end and I overtook him - despite being WAY behind in the midgame. Concordia with Jeremy, Adam Kunsemiller, and Ben Sklar. Mac Gerdts' newest game. I liked Hamburgum more than most seemed to, and I liked Antike, and Navegador as well. This one hasn't got a Rondel in it - rather it's more like Kreta or Mission Red Planet where you play a card and then you cannot use it until you play the card that collects all your cards back up. The game action reminded me of Navegador, where you get more cards to use, each with a scoring condition on it, and then you also try to satisfy your scoring conditions more and more. 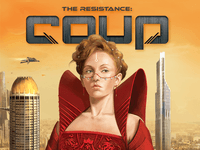 I liked Concordia, and look forward to playing it again. Played this game twice, once with Jeremy and Sean McCarthy, and once with Jeremy heads up. This is a cute little microgame, and I wanted Jeremy to see it so he could compare with Battlecruiser, a TMG submission he had played the night before. Battlecruiser is supposed to be a similar scope, though it's not as micro as Love Letter. I wanted Jeremy to see this microgame as well, and I wanted to see how it played. We just played 1 quick game with Sean. I thought it was pretty cool, but frankly there's not a lot to these microgames (I think I just prefer games with more to them). Hawaii with Nyomi and Sean Flinn. I played Hawaii back in 2011 once in person, and several times online, but I haven't played it since. It's a pretty cool game, but not really worth the effort of setup for regular play. So it's cool that it's available online. I went for lots of fruit right off the bat, getting a lot of income, and I got some good scoring off of it from a god tile and some Hula dancers. but it wasn't enough, Nyomi managed to score about 11 points more than I did. She was getting 4 points per Spear tile, and some decent points from taking her boats to the most expensive dock. Game 1 with Anthony Gallela, Sean McCarthy, and Matthew. We accidentally played a little bit wrong for the first half of the game or so - but I don't think it was to big a deal. We played that the cost on the card had to be paid twice to do both actions if nobody clashed with you. In reality you only pay the cost once. I doubt it made much difference one way or another. I find Glass Road pretty interesting. Managing resources when you have virtual workers constantly making Glass and Brick as soon as they can (whether you like it or not) is tricky. I do think the card play portion of the game is more cumbersome than necessary though - I can't help but wonder why it isn't just "choose your 5 cards, then take turns leading one (other players are forced to follow)" rather than all players playing simultaneously, then revealing one at a time, meaning a player who happens to play the same card a the same time as an earlier player does not get to follow, but is guaranteed to get the full effect of the action. Game 2 was with Jeremy and Jennifer Geske. Both games were won by a player who had a "1 point per contiguous landscape tile (of one type)" building. I think my own downfall in both games was not building enough bonus scoring buildings. 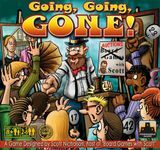 I would play this again, maybe at BGGcon. Learning a game from a rulebook is never the best way to do it, and at a convention - with distractions all around - learning that way becomes even harder. I have seen worse rulebooks than the one for Craftsmen, but I've seen a lot better as well. It took us about an hour and a half to learn how to play. And now that I know how to play, I could probably teach it in 10 minutes. Craftsmen is a fairly interesting, if frustrating, worker placement resource translation game. You turn raw materials into half-products, which you can either sell for money (and maybe a point later), or you can put toward a Finished Product, which is shipped for points. here seems to be more direct interaction than in other games of this type, but most of the game has players fighting against the puzzle of how to navigate the round structure to get the right buildings in play. There are some interesting worker placement dynamics, and there is money card management - when buying new cards, you must pay with the correct colored money cards (matching the color of the building card). 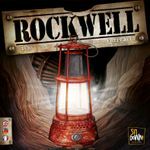 It seems like the kind of game I would like, but if the game length doesn't come down with experience, then I don't see myself getting it to the table very often.